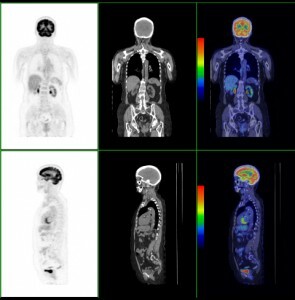 A PET scan uses a small amount of a radioactive drug to show differences between healthy and diseased tissue. You will receive an intravenous (IV) injection of the radioactive substance. Scanning takes less than 45 minutes. If given an intravenous injection, you will feel like a slight prick. However, you will not feel the substance in your body.